The first violin part for Mendelssohn's Symphony No. 5 in D major/D minor, Op. 107 (nicknamed the Reformation Symphony) has been edited by Norman Carol, the legendary former concertmaster of the Philadelphia Orchestra, who held the position from 1966 to 1994. Carol's bowings, fingerings and other editorial markings have been added throughout the score. Mendelssohn's Symphony No. 5 was composed in 1830 in honor of the 300th anniversary of the Presentation of the Augsburg Confession, a key event in Protestant Reformation (hence its name the Reformation Symphony. Like the Fourth, it would not be published until after Mendelssohn's death. The fourth movement is based on Martin Luther's chorale Ein feste Burg ist unser Gott (A Mighty Fortress Is Our God). At the very end of the coda, a powerful version of Martin Luther's chorale is played by the entire orchestra. Download and print the score today to gain access to expertly edited Mendelssohn Reformation Symphony No. 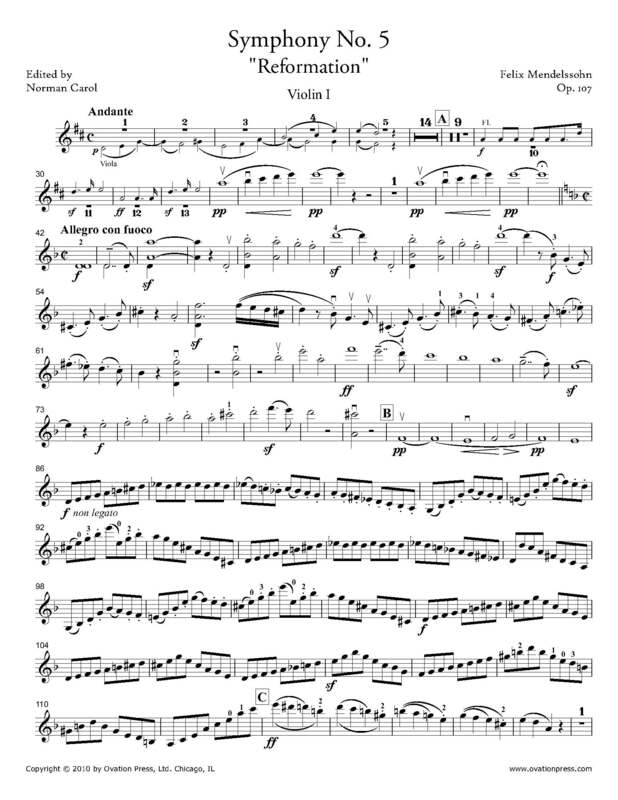 5 violin fingerings and bowings from Norman Carol!